A moment to reflect, remember, and thank our Vets. "represent(s) every brave Massachusetts service member who gave his or her life defending our country since the Civil War." We have provided sound for Chris Farris of Michael P. Wasserman for several years now. It is an emotional event, as relatives read the names of their fallen family members. Many folks, Boston area natives and those from other cities and countries, pause at the flags to pay their respects and to interact with family members and attendees, often finding that we all have more in common than we think. A view from the top of the hill. One of many families at the event. Boston's Mayor Menino, just barely out from a long and brutal hospital stay, but at the podium giving thanks and remembering those who gave their all. It's been almost 4 years since we launched version 4.0 of productivemedia.com, so we figured it was due for a refresh. Kudos to Kathryn Roberts and Heather Kent for chasing down the details. We've stripped it down a bunch, focused it on what's important and moved it to a system that supports mobile adaptive design; so it ought to work better on your phone. Our friend Dr. Rafay Mehdi asked if we could help international performer Heather Schmid put together a TV series pilot to bring along with her on her upcoming performances in Pakistan. We were delighted to help. Heather is an amazingly talented songwriter, performer, and an unfailingly positive person. When she sat down to talk with us for the interview section of the pilot, we realized that we had worked together ten years previously on a couple of Boston-area shoots. Time flies. . . 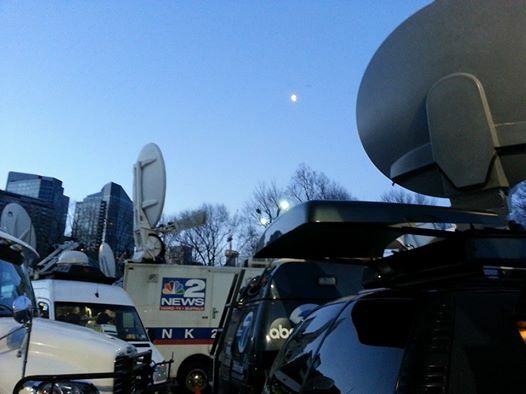 So, how to describe the overwhelming success that our secure webcasting solution has been? Well, um, we can't! Or at least we're not allowed to! We did manage to shoot and deliver the Siemens competition at MIT and interviewed some brilliant young minds describing things that are pretty darned impressive. This is our fifth year shooting, editing and posting the Northeast Division news release for Siemens and the Summerlin Group. We produced two secure live webcasts of a quarterly meeting for a large manufacturing company that prefers not to be named - complete with full AV services support - 2 proejctors, screens, PA system, camera, etc. We produced two Client Conference webcasts, complete with AV and video production support for their dinners, workshops and full-day presentations for a Boston-based financial company, who also prefers not to be mentioned, supplied an audio console, PA system and technician for a meeting at Hanscom Field, supplied a bunch of 50" and 60" LCD screens for various clients, edited a presentation for yet another financial customer who would prefer to be nameless, edited video for Liberty Mutual Insurance, provided projection for our friends at Boston Early Music Festival, provided projection for Raytheon, several hundred DVDs for WGBH, and finished up by providing playback, projection, screens and sound for the South Shore YMCA "Enchanted Evening" on November 30th, which raised over $232,000 for ther annual support campaign! ... and while the shot looked great, the message failed. Miserably. We needed to dump out 3 different powders (by hand) to show how each of them might spread if they spilled on a factory floor. The problem was: The manner in which you dumped out the powder so completely changed the results that it completely distorted the message they were creating. However, we had a way to fix that. If you've ever stopped by the Productive Media offices, Seth's edit suite. . . often looks like a lab. Hard drives stacked, servers taken apart (sometimes still running), circuit boards in a pile to one side and often a bread board or two waiting to go under the soldering iron strewn about the console. So one trip to Microcenter, a trip to You-Do-It Electronics, a bread board, a computer power supply, 2 open source libraries and some custom code later, Seth had removed the variable human element from the drop without changing the parameters of the shot. We can tell you that each of the beakers follows the same path over the same 2000 milliseconds of time.... Seriously. Decade One for Olin College! This year Olin College celebrated its first ten years of educating some of the best math/science/engineering minds in the world. Multiple displays of amazing research, work, and fun and games were available to demonstrate how much Olin students have to offer, and how they've already changed the world in just ten short years. Productive Media received the call to get footage of the event and all of the trimmings. There were multiple fascinating displays, demonstrations and most notably, enthusiasm for the the entirety of all of the science/math/engineering disciplines represented at Olin. The celebration concluded just a few hours before Hurricane Sandy made life on the East Coast a little, um, inhospitable. In early September, we were contacted by Jacqui Conrad of delaCruz Communications to assist with the Joslin Diabetes Center event "Ritmos de Salud" at New England Conservatory's Jordan and Brown Halls. Ritmos de Salud (Healthy Rhythms) is a benefit concert to promote awareness and raise funds for the diabetes care, education, research and outreach programs of Joslin’s Latino Diabetes Initiative (LDI). 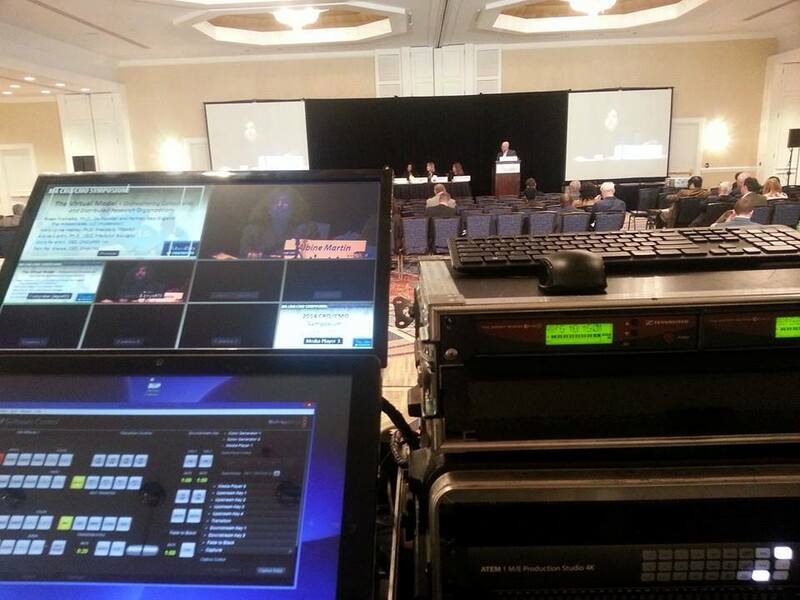 Productive Media provided technicians, switched playback, projection and screens in both halls for the event. It was a successful social event with tremendous food, music and a fun atmosphere! 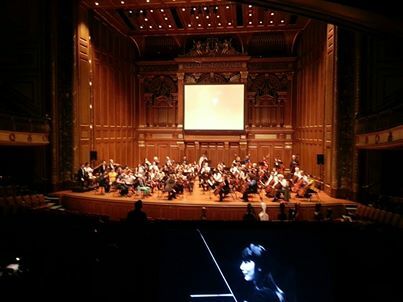 New England Conservatory's Jordan Hall was the locus for Creation the first weekend in June! Seth Wereska and Geoff Briggs were contacted by David McCue of Chorus pro Musica to project moving images created by Joss Sessions for Haydn's Creation onto upper pipes of the hall organ. Every possible projection space and sightline was investigated and rated. Joss flew in from Leeds to oversee the results and to creatively live-mix the visual elements for the production. The results were impressive! Where to even begin this news item? This May we provided technicians, screens, projectors, flat panels, cameras, PA systems, webcasts and more for Brown University, Olin College, Boston University, Harvard's Kennedy School of Government, UMass Lowell, and at least one or two more institutions of higher learning that got included in the enormous equipment and manpower maelstrom that is the month of May in Boston. At BU, Brown and UMass Lowell, we assisted our long time compatriots at Capron with people, cameras, PA systems and wireless mics, 60" flat panels, switchers, and projection. 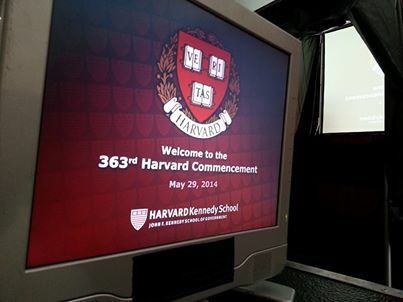 At Harvard we provided technicians, camera, projection and screens for ATS, with whom we have worked since 2006. 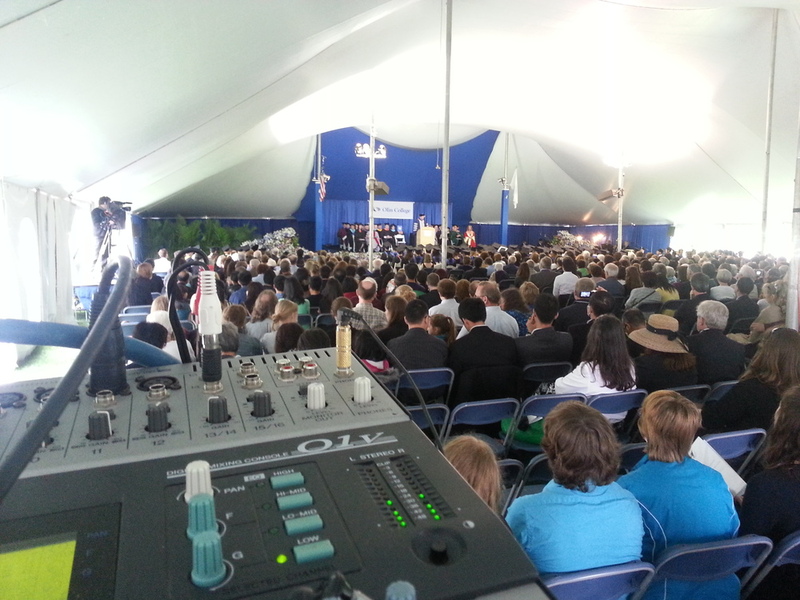 For Olin we provided sound, cameras and a webcast. In addition, the Communications Department at Olin then took our camera footage and edited it for their graduating seniors. Oh yes, and a client conference webcast for a renewable resources investment group, a quarterly meeting for an automation company, a half dozen small projector rentals for meetings and graduation parties, shoots and edits for Liberty Mutual Insurance and the Dana Farber Cancer Institute, events at Legal Harborside and Raytheon. . .Whew! Okay, actually the CEOs in the CEO Club Of Boston are really nice folks. Led by Chairman Fred Greene, the Club allows CEOs to share their insights with one another in a safe and nurturing enviroment. Member Jeff Starfield, CEO of CDWorks contracted us to videotape the 10th Anniversary meeting. Our CEO Geoff Briggs videotaped the event, liked what he saw, and soon joined the Club. Productive Media now provides all of the audio and video recording services, and also provides Audio/Visual support in the form of projectors, wireless mics, knowledge, and whatever else is necessary. The CEO Club of Boston is a terrific, well-run forum for CEOs to share truly inspiring thoughts and opinions, all while learning something new.